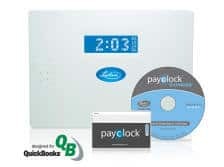 The PC50 comes with our patented PayClock Express software. Together, they create the perfect solution for any small business environment. Designed for companies with up to 50 employees, Lathem’s PC50 automatically calculates total worked hours including overtime. Employees “punch in” and out at the terminal with a proximity badge. A large display and internal speaker provide employees instant audio greetings and their in/out status. The PC100 offers big business efficiency at a small business price. Designed for small businesses with up to 50 employees (expandable to 150 employees), Lathem’s PC100 is bundled with our patented PayClock EZ software and automatically calculates total worked hours including overtime. Employees clock in and out with reusable magnetic stripe badges similar to a credit or debit card. Payroll data can be printed to reports from your PC and interfaced directly into your payroll software. Standard payroll interfaces include QuickBooks®, ADP®, Paychex® and more. TouchStation is a state-of-the-art biometric system that uses fingerprint technology to instantly identify employees and eliminate costly “buddy punching.” Designed for small businesses with up to 50 employees (and expandable to 150), employees clock in and out with the touch of a finger. A large display and internal beeper provide employees instant feedback of their in/out status. 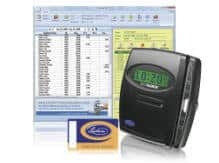 Packaged with Lathem’s PayClock EZ software, TouchStation automatically calculates worked hours, including overtime, sick and vacation time and provides 22 informative time and labor reports. 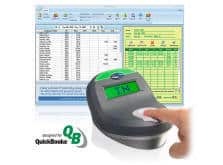 It also seamlessly integrates with major payroll software such as QuickBooks®, ADP® and Paychex®.